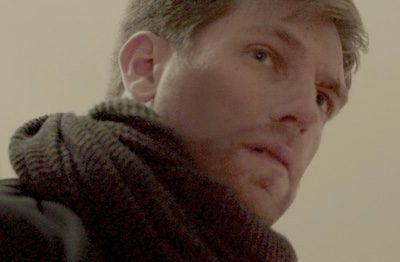 In the world premiere of Steve Yockey’s Wolves at Actor’s Express, Joe plays Wolf, who’s pulled into Ben (Clifton Guberman) and Jack’s (Brian Crawford) distructive relationship. In the Aurora Theatre production of Bruce Noris’ Clybourne Park, Joe plays the button-down racist Karl and, 50 years later, Steve, a white homebuyer bent on moving into a now trendy black neighborhood. Joe Sykes as Charles Heyman with Ann Marie Gideon as Lousia Geller. Below with Mark Cabus. Images by Jeff Roffman. In the Alliance Theatre production of Janece Shaffer’s The Geller Girls, Joe plays New Yorker Charles Heyman, a handsome provocateur. In the Actor’s Express production of Next Fall, Joe plays Luke, a wide-eyed innocent with a fundamentalist Christian background. “Sykes brings out the attractive, easygoing simplicity of Luke — he’s perfectly convincing as he prays over a sandwich. Luke is certain he’s on his way to heaven, so nothing frightens him and he doesn’t sweat the small stuff.